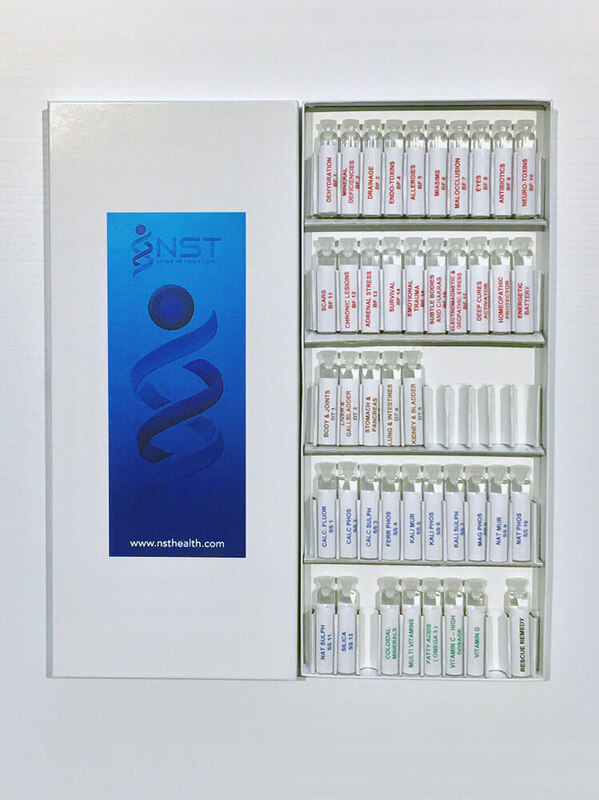 The NST Integrated Test Kit has been specifically designed to provide clinicians a simple yet powerful method of being able to access the human organism’s energy system using Radionic Frequencies (imprinted in a specially prepared water carrier contained in small glass vials) for the express purposes of more thoroughly provoking self-regulation thereby creating better sustainability of corrections achieved with NST body work. Radionic Frequencies have an intimate affinity for the human organism’s energy system and consequently help to quickly detect negative blockages that may be interfering with the body’s self-regulatory capacity. Additionally, Radionic Frequencies may also be used to help identify deficiencies by testing the organism with positive substances that may further enhance the body’s ability to function optimally both structurally and physiologically alike. In this context the NST Integrated Test Kit is designed in a hierarchical fashion starting with 17 classical blockade filters (negative frequencies) plus one special additional activating frequency (DCA) followed by a series of 23 enhancement filters (positive frequencies) contained in 4 specific groups (toxic drainage, biochemical support, specific nutritional support, emotional support) designed to create deeper integration within the organism and better sustainability of corrections in a logical step by step fashion. Note: Specific testing and correction instructions are given throughout the NST Deep Cures seminar https://nsthealth.com/deep-cures/ and attending a live seminar is the optimal method to gain this information. A brief detailed look at the frequencies and their specific relevance. A. Blockades – 17 radionic filters that when active are known to prevent the human organism from self- regulating optimally and maintaining corrections.Following is a brief overview of each blockade filter. Dehydration – all systems of the body require water for the organism to survive and function. Mineral Deficiencies – all systems of the body require minerals for the organism to survive and for cells to reproduce. Drainage – indicates that some part or all of the body needs toxic relief. Endo-toxins – come from diet and lifestyle and can block nerve receptors, organs, inflame tissue and block circulation. They also set the scene for allergies, bacteria’s and viruses to take hold. Allergies – can come from diet or environment and can act as above or otherwise trigger immune system into full blown war e.g. hayfever, skin conditions etc. Miasims – are aspects of viruses that are found in the cells and affect our genetic programming. They are generally passed down through generations where they originally occurred as a result of diseases at that time and retreated into the cells of our ancestors as part of not wanting to leave their host at that time – virulent. They trigger the body into a confused protection status. Malocclusion – will often trigger the body back into compensation by sending incorrect proprioreceptive information to the sensory cortex regarding posture. Eyes – effect our total spatial orientation, balance, proprioception and emotional status. If involved can re-trigger unwanted compensations. Antibiotics – come from earlier injections or oral use of anti-biotics and suppress the organism into a non-responsive state. Neuro-toxins – come from heavy metals (mercury), petro-chemicals, exhaust fumes, solvents, and pesticides etc, which have an affinity for the nervous system. Scars – can have a profound effect on energy flows (meridinal) within the body thereby preventing auto-regulation from initiating. Chronic Lesions – such as herniated discs, torn or injured tissues and even deteriorating cancerous tissue may require further attention so as not to interfere with the auto-regulatory capacity of the body. Adrenal Stress – adrenal glands that are in a state of exhaustion or over work may not be able to participate in the process of cortisol distribution as the body attempts to come back to balance(e.g. fibromyalgia) or if over active somatotropin may be affected causing a diminishing of collagen fibres for fascia, muscle and bone tissue. Survival – the hypothalamus and limbic system work together to preserve life and regulate homeostasis in the living organism. Imbalances in either of these centres can have a direct and rapid affect on the neuromuscular system and in fact the whole body. Emotional Trauma – deep emotional trauma can keep the organism firmly stuck in survival mode and/or cause sabotaging of sessional outcomes. Subtle Bodies – can hold vibrational imbalances of emotions (astral body) or disease conditions (etheric body-meridians) preventing the physical body from following its energetic counterpart back to balance. Electromagnetic and Geopathic stress – some individuals are under constant EM and GP stress without even knowing it. Power lines, computers, lay-lines, water pipes, electric blankets etc can cause a sabotaging of results as they profoundly interfere with and disturb subtle bodies. Deep Cures Activator (DCA) is an additional filter designed to better explore the intra cellular environment for when patients may present with more auto-immune or degenerative conditions. B. Drainage – 5 radionic filters that when testing positive indicate a need to drain specific organs or areas of the body. Although more than one drainage tea may be taken at the same time and produce excellent results, typically isolating (by instrument or muscle testing) which one formula is the most appropriate for the patient, will also provide excellent results. C. Biochemistry – 12 radionic filters that when testing positive indicate a need to support the organism at a biochemical level.Tissue salts are prepared homeopathically and are available in either tablet or liquid spray form via most good health food or chemist stores.Tissue salts are not nutritional substances in themselves but contain 1 part per million of the substance they represent which helps to alert the body in picking up that substance and transporting it into the cell more efficiently. Unlike drainage teas, if more than one tissue salt tests positive its best to give all tested up to four individual salts. If more than four salts test positive this is generally an indication that the patient is quite debilitated or specific nutrition levels in the blood are very low. In such cases its wise to recommend that all twelve salts be taken in a combination formula, simply known as Combo 12. Following is a simple chart outlining each Tissue Salt and is quality and potential usage in relation to structural and spinal work. Further instructions may also be found on the product itself. Calcium Fluoride Elasticity Salt For joint problems and muscular soreness. Cracked & mapped. Building material For lowered vitality, body aches, broken bones, osteoporosis. Swollen, numb, white with pimples (often on tip). Connective Tissue For skin ailments, pimples and slow healing wounds. Flabby, clay coloured (with a yellow coated base). (onset of illness) For inflammations, fevers, and muscular aches and tissue injury. Clean, red, swollen, and inflamed appearance. Potassium Chloride Glandular Tonic For congestion, coughs, colds or respiratory ailments. White to greyish white coating, can be swollen. Potassium Phosphate Nerve Nutrient For nervous tension, depression, nerve damage and neuralgia. Brownish to mustard coating, stale and offensive odour. Potassium Sulphate Skin Salt For skin ailments, brittle nails and poor hair condition. Yellow and slimy. Anti-spasmodic and Nerve Nutrient For sciatic/shooting pain, muscle cramps, colic and flatulence. Usually clear. Sodium Chloride Fluid Distributor For dry or excessive fluid, rehydrates spinal discs, loss of smell. Clear, frothy or watery, can be mapped with blisters. Sodium Phosphate Acid Neutraliser For acidity, stomach upsets or heartburn. Cream or golden yellow (worse at back). Sodium Sulphate Water Eliminator For biliousness, liver upsets and water retention. Greenish to brown or grey at base (bitter taste in mouth). Nature’s Sculptor, Essential for Calcium placement For toxic accumulations, nails/hair helps repair tendons, ligaments and spinal discs. Hardening with ulceration. D. Specific Nutrition – 5 radionic filters that when testing positive indicate a need to support the organism at a specific nutritional level. Specific nutritional deficiencies can lead to a number of health symptoms ranging from pain, low energy to emotional depression and much more. If one or more of the specific nutritional filters test positive it is indicated that all may be taken. However it is always prudent to seek the advice of a nutritional expert such as a naturopath and request that a hair analysis test be undertaken to verify more precisely exactly what dosages will be optimal for the patient and for how long the supplements need to be taken. E. Rescue Remedy – 1 radionic filter that when testing positive indicates the need to take Rescue Remedy there and then.The frequency may be corrected directly on the body however Rescue Remedy is also available in liquid and spray form via most good health food or chemist stores.Rescue Remedy may be taken in emergencies or when going into a known stressful situation or as often as required simply as a preventative strategy.